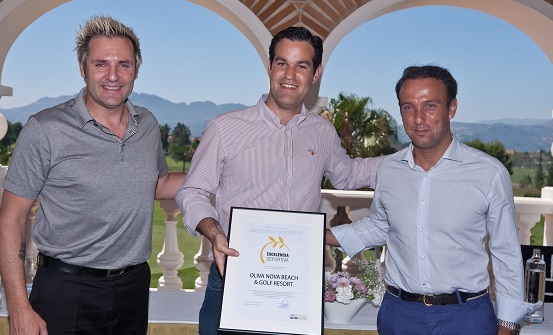 On the occasion of the Anniversary Tournament of the Golfclub Oliva Nova, the Oliva Nova Beach & Golf Resort has received the Sports Excellence Award and the Quality Label S10 from the General Sports Director of the Generalitat Valencia, Mateo Castellá and Santiago Cañizares, Spanish Delegate for the Sports Excellence Seal. Said award has was made possible after having successfully mastered the evaluations of the sports facilities within the Resort, the football pitches, the golf course, the gym, tennis and paddle courts as well as the adjoining equestrian complex. The evaluations involve an exhaustive process designed by the Chair of Sports at the Polytechnic University Valencia for the Valencian Campus of Sports Excellence. The seal is guarantee for excellence in organisation and management of sports activities in Oliva Nova and acknowledges the great effort in order to satisfy staff and users. The Quality Label S10, for its part, certifies the high standard of the sports facilities.